When Mojang first released Minecraft onto the Xbox 360, I played it almost religiously. The excitement of “building” paired with the sometimes awkward exchange of ideas in a multiplayer setting was just really appealing. I created a lot of works of architectural abstract, rarely coming up with a cohesive design. These weren’t the kinds of buildings you could go and place in the real world, at least, not without some kind of pending lawsuit or liability issue. But it wasn’t really ever about my designs, or my realizations, but rather how I could go anywhere and view anything that someone else had created. Minecraft is more than just a virtual Lego clone; it’s a living, breathing, digitalized art museum, with no preset requirements for display. I recall spending hours wandering around and seeing the ever changing sites from world to world. That was a main issue for me, though. It sometimes took hours just to make it through a large world, especially if the architecture was spread thinly across the map. Sure, there were some websites that popped up, showcasing screenshots and videos of wondrous user creations, but they just didn’t have the same feeling of “being there.” Seeing a copy of someone’s art online, and viewing it firsthand in a galleria are two completely different experiences, even if you’re viewing the same creations. That’s what we needed, a virtual gallery for Minecraft creation, without the need to spelunk across vast undeveloped lands. 13th lab, the mobile computer vision development company, has delivered this wish, working in close conjunction with Minecraft creator Mojang to bring the interesting new “Minecraft Reality” application to iOS. 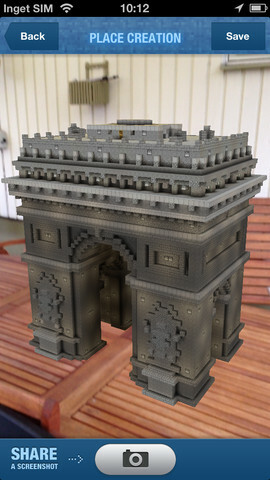 The basic concept of this app is to allow users to place created Minecraft objects and architectures into the real world through use of augmented reality. Some of you gamers out there might recall seeing AR practices in the Nintendo 3DS and Playstation Vita. But for anyone unfamiliar, AR is the process of placing a fully viewable (from all angles) 3D object into a real world setting by use of a camera. Minecraft Reality will work through any iDevice camera and can literally display creations anywhere. Set a Minecraft car in a parking lot or envision a mighty vessel out on the riverfront. You can even place a miniature version of the Eiffel Tower next to the real one, pending you have the time and effort to create it. But even if you don’t spend time crafting AR works of art, you can still get in on the action by placing some pre-made objects in whatever locations you want. There is an incredible sense of social media here, too, as these placed creations will not just be there for your viewing pleasure, as they can also be seen by anyone, anywhere, with the correct GPS coordinates. It’s for this reason that I consider Minecraft Reality to be more like a virtual art museum which spans the globe, untethered by walls or invisible boundaries. It’s truly an expressive, entertaining, and decently executed idea. I can finally view works of art from fellow Minecraft players without having to take virtual excursions. If you want to get in on all the AR fun, then be sure to grab Minecraft Reality right now from the Apple App Store. The app only costs USD $1.99, which is pretty cheap considering that you’re getting free roam in what may be the world’s largest art galleria.